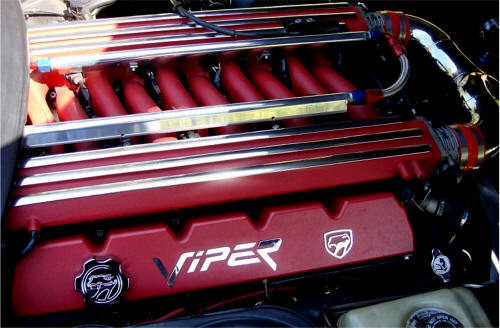 Really Dresses up your engine compartment! 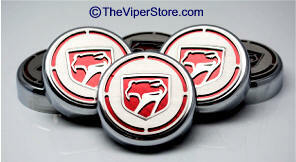 Chrome metal cap cover for any engine component. Fastens on top of stock cap with Velcro. 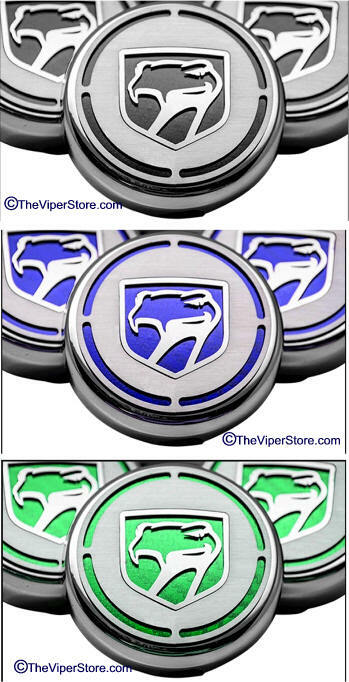 Includes metal 3-D cut out Viper head logo on top with colored carbon fiber background. 2.75" inner diameter. 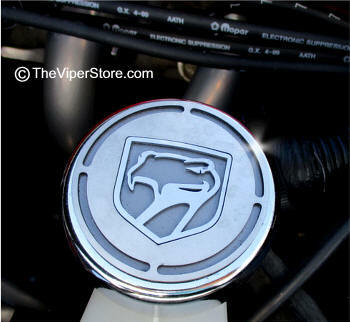 Fits most all cap sizes in your engine compartment. 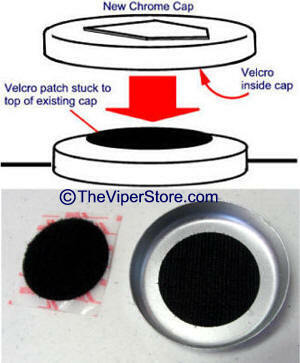 Fixes to the top of your existing cap. Easy to install or remove. 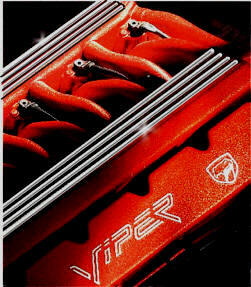 NOTE: Includes four (4) caps covers Plus one (1) radiator cap cover. 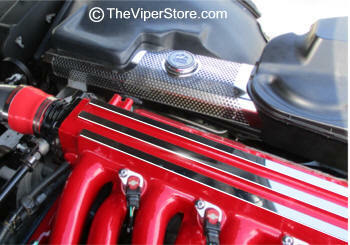 These mirror polished stainless steel strips really dress up your engine. 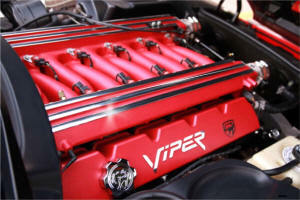 Has been a big hit at the Viper rallies! 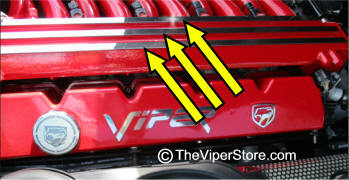 The six strips fit directly on top of the existing strips on top of your engines manifold. Unlike the original dull exposed brushed steel strips, these metal strips stay shiny. They are heat and stain resistant. Self adhesive on the back of each strip makes installation easy. Includes - Six strips. Six 5/8 inch wide strips . 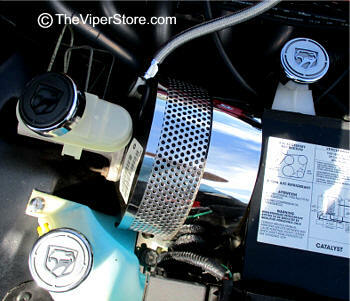 When installed properly will stay put and will not come off by heat, cold, or vibration. 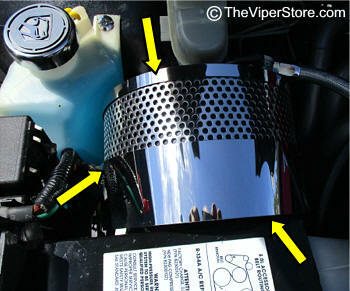 These chromed high tech vinyl strips with tapered rounded edges really dress up your engine. 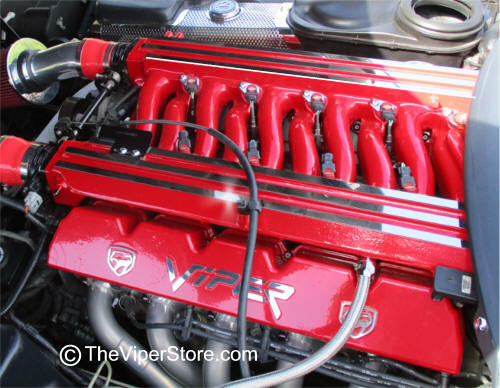 Has been a big hit at the Viper rallies! 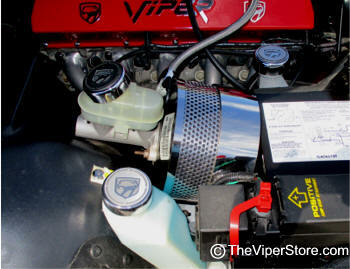 The six strips fit directly on top of the existing strips on top of your engines manifold. Unlike the original dull exposed brushed steel strips, these vinyl chrome strips stay shiny. They are heat and stain resistant. Self adhesive on the back of each strip makes installation easy. Includes - Six strips with beveled edges. Six 5/8 inch wide strips . 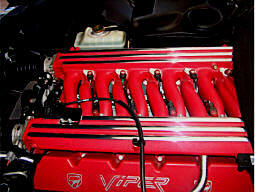 The eight strips fit directly on top of the existing strips on top of your engines manifold. Unlike the original dull exposed brushed steel strips, these vinyl chrome strips stay shiny. They are heat and stain resistant. Self adhesive on the back of each strip makes installation easy. Includes - Eight (8) strips (23 1/2" X 3/8"). All stainless steel brake booster cover with perforated wrap and polished trim. Will not discolor, rust or ever loose its mirror polish. Easy installation.